PlayStation 4 console sales over 30 million. 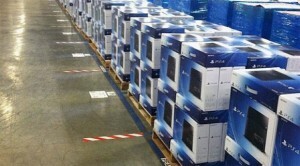 Sony on Wednesday announced that PlayStation 4 video game consoles have sold over 30 million piece worldwide. Over 30.2 million piece PlayStation 4 are sold worldwide as of November 2015, according to Sony Computer Entertainment. Microsoft hasn’t released the Xbox One console sales figures, which have been estimated at about half of their rival PlayStation 4. PlayStation 4 and Xbox One were released in late 2013. “We are sincerely grateful that gamers across the globe have continued to choose PlayStation 4 as the best place to play since launch two years ago,” SCE global chief executive Andrew House said in a release.